Welcome to the 100th edition of the Carnival of Genealogy! Can you believe it? 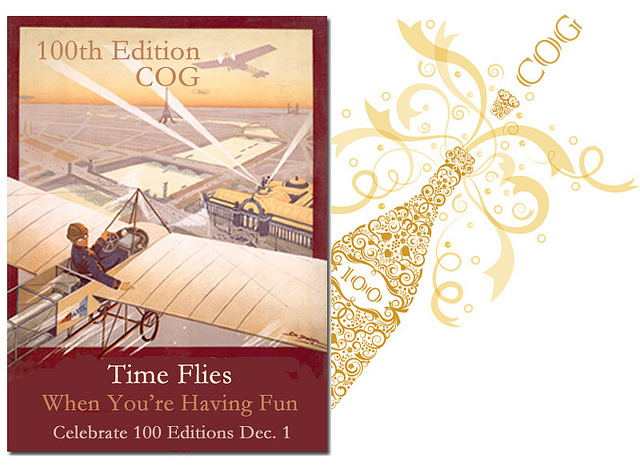 100 editions of the COG! Boy, it feels good to be here!!! Never in my wildest imagination did I envision this milestone when I put the first edition of the COG together. I'm happy, I'm proud, and you should be too. This edition is quite the publication... it took a series of 4 posts to accommodate all the submissions. Woo Hoo! Look at us now! From little acorns grow big oak trees... and from one blogger's idea came a whole community of talented writers focused on the topic of genealogy. Before I go any further, I want to thank everyone who has ever written for, hosted, or read the COG. You gave the Carnival of Genealogy its longevity. I could never have sustained it this long all by my lonesome. And it wouldn't have been anywhere near as good! I am grateful for all the comments you've shared with me too. I appreciate your support in all the ways you've shown it. I couldn't ask for better contributors, readers, or friends. And now, on with the show! The topic for this edition of the COG is: There's one in every family! This 100th edition of the Carnival of Genealogy is a 4-part series. The first two parts consist of articles written about specific people, the third part covers places and things, and the fourth part contains miscellaneous articles. There were some terrific interpretations of the theme, many clever outside-the-box ones. You'll meet people you'd fear, ones you'd love to meet, some whose stories will bring you to tears, and some will give you a good belly laugh (humorous articles are designated with "**"). You'll read about items you'd love to inherit, recipes that will have your mouth watering, and pet stories that will pull at your heart strings. There's some poetry that will move you and videos that will amaze you. It's all here for you in COG 100. I've numbered the articles for reference purposes only. The numbers do not indicate the quality of writing or time of submission. Without further ado, let us raise our glasses and drink a toast - champagne of course! Here's to 100 wonderful editions of the Carnival of Genealogy! Long live the COG!!! Poster by footnoteMaven. Thanks fM! Starting us off is an article from Craig Manson, an overview of the history of the Carnival of Genealogy. If you haven't read this one yet, do not pass Go, go directly there now! Craig Manson presents The Carnival of Genealogy: Century Edition posted at GeneaBlogie, saying, "Stopping by after a long absence, Craig finds a family reunion underway in the COG's big tent." 1. Greta Koehl presents There’s One – Or Two – In Every Family: A Visit with Bun and Square Brinlee posted at Greta's Genealogy Bog, saying, "I'm taking a break from heartbreak and a siesta from scandal to write about two admirable, beloved, and unusual members of the Brinlee family: Bun and Square Brinlee, who seemed more like legends of the 19th century than inhabitants of the 20th." 2. Amy Coffin presents COG 100: There's One in Every Family posted at We Tree, saying, "Every family has its share of tall tales, but what happens when most the stories mention the same name? There's one in every family and I'd like to introduce you to mine." 3. Katie Chambers presents Ernest - a Skeleton in the Chambers Family Closet posted at From Little Acorns, saying, "Skeleton in the Cupboard..."
4. Jacky Gamble presents From Hobby to Business: My Great-Grandfather's Talent for Woodworking posted at Vermont Genealogy. 5. Dorene Paul presents There's One in Every Family: Great Grandma Ada and Her Love of Family Heritage posted at Graveyard Rabbit of Sandusky Bay, saying, "Dorene from Ohio inherited the love of family history from her mother, who got the bug from her paternal Grandmother, Ada Steen Parker. Grandma Ada was the "one in the family" to whom we turned for learning more about our roots." 6. Becky Wiseman presents He was a Rascal... posted at kinexxions, saying, "He wasn't a Black Sheep. Not really. He didn't do anything “serious” like murder or armed robbery. He just lived a little bit outside the law sometimes. But he got caught. Frequently. And he was the grandfather that I never knew..."
7. Charles Hansen presents Carnival of Genealogy #100 posted at Mikkel's Hus, saying, "Sure wished grandpa had lived longer, think of all the fishing he would done. I sure liked the fish he caught." 8. Myrt presents My father-dad, the great hunter posted at DearMYRTLE, your friend in genealogy, saying, "Every family has a "hunter" but in Myrt's case, she only has to go back one generation to find one." 9. Kerry Scott presents The Body On The Kitchen Floor posted at Clue Wagon, saying, "I'm not actually sure there's one of these in EVERY family, but there's one in mine." 10. Nolichucky Roots presents He weren't no saint... posted at Nolichucky Roots, saying, "Thanks, Jasia, for this wonderful topic. I've long wanted to write about Philip but needed a bit of a push to get past the voices of his devoted descendants echoing in my head. The 100th COG was just the push. Congratulations on years of good work." 11. Barbara Poole presents There's One in Every Family! posted at Life From The Roots, saying, "With a little bit of luck after seven years of research, a cousin and I discovered our ancestor had changed his last name, on his voyage from England to Canada. And, John Molson, the brewery founder knew of it. Fortunately, for me, there was much documentation." 12. Linda McCauley presents The Long Lost Relative posted at Documenting the Details, saying, "There may not be one in absolutely every family but certainly many families have a long lost relative, especially if you go back a few generations. William Robert Taylor was a long lost relative through no fault of his own." 13. Brenda presents "There's One in Every Family" posted at Brenda Dougall Merriman, saying, "In my context, the words unique and special and family are interpreted as “one in every generation” of a family line. Part of the family history fabric for me is to see a characteristic or skill appearing in one generation after another as a sort of genetic inheritance. Certainly there are recurrent threads (genes?) in branches of my family history. Here is one of them." 14. Lorine McGinnis Schulze presents COG: There's one in every family! posted at Olive Tree Genealogy Blog, saying, "Burning his son's house down? Yep, one of my ancestors was a trouble-maker extraordinaire... but there's also Anna who divorced her hubby in Germany in 1660s - after running off and having a child with another man. So shameful that the minister wrote about her wicked ways in his church book"
15. Donna presents The Sister Who Disappeared posted at What's Past is Prologue, saying, "There's one in every family...the relative who disappeared. Or seemed to, anyway - the unsolved mystery. In my family, the one who disappeared is my grandaunt Jennie. Did her story have a romantic happy ending, or is it just another sad tale?" 16. Cheryl Cayemberg presents 100th COG - There's One in Every Family - Martin Joseph Villers posted at Have You Seen My Roots?, saying, "I had fun with this! Now I'll have to go and transcribe the records! Hope you get the 100 bloggers you'd like! :)"
17. Sue Edminster presents Pit and Siz posted at Echo Hill Ancestors Weblog, saying, "This post is from the past...but I still treasure my brother's wonderful sense of humor and loving spirit. So he fits the "There's One In Every Family" category to a "T."
18. Frances Ellsworth presents 100th edition of the Carnival of Genealogy "There's one in every family!" posted at Branching Out Through The Years, saying, "Congrats on 100 COGS." 19. Lisa Wallen Logsdon presents Boy Hero Saves Life of Young Abe Lincoln posted at Old Stones Undeciphered. 20. J.M. presents There's one in every family: Genealogy Researchers! posted at Tracing My Roots, saying, "There’s one in every family. One what, you might ask. Well, one ‘nutjob’ who takes on the daunting task of delving into family history. This is my ode to those who came before me." 21. Lidian presents Charles W. Morgan: A 1900 Bonfire of the Vanities posted at The Virtual Dime Museum, saying, "This is the story of my great grandfather's brother-in-law, Charles W. Morgan, a New York stockbroker who became very rich through tricky means, and was arrested for grand larceny in 1900." 22. Mary Warren presents There's One In Every Family posted at Mary's Musings. 23. John presents She had no children. She had many. posted at Anglo-Celtic Connections. 24. Linda Hughes Hiser presents Carnival of Genealogy, 100th Edition--Walter Knapp posted at Flipside, saying, "Walter Knapp....fleet of foot and a daring rescue." 25. Stephanie Varney presents Black Sheep Sunday--Hannah Holmes | The Ancestor Blog posted at The Ancestor Blog, saying, "There are many colorful characters in my family tree. However, I thought the story of this mysterious and enigmatic woman, Hannah Holmes, the progenitor of my mother's entire paternal family line, bore telling to the public. Read on about about love, lust, illegitimacy, and possible prostitution in 18th century Ipswich, Massachusetts!" 26. Karen Hammer presents The Upbuilding of a School District posted at Ancestor Soup, saying, "A young teacher dedicates her career to education in a remote Norwegian fishing village, through war, poverty, and cultural diversity." 27. Nancy Messier presents Sometimes A Family Has More than One posted at My Ancestors and Me, saying, "Women and children.... Surely you have a foremother in your family who had 13 or more children, right?" 28.Gini Webb presents 100th COG Edition ~ There's One In Every Family ~ posted at Ginisology ~, saying, "100th COG...that special one is, Mom." 29. Janet Iles presents Carnival of Genealogy #100 - Every family has one posted at Janet the researcher, saying, "There is a family photographer in my family. I hope there is one in yours." 30. Randy Seaver presents Genea-Musings: There's one in every family! posted at Genea-Musings. 31. Joan Miller presents One in Every Family ? 30 Babies! posted at Luxegen Genealogy and Family History, saying, "There is ONE in every family - read what 30 babies had to do with the "ONE" in Joan's family." Part 2 of Special People is coming up next!